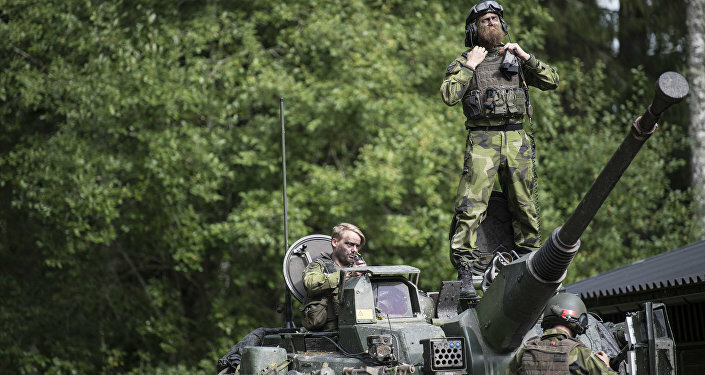 A train has collided with a tank and derailed near the town of Trosa, south of Stockholm, marring the Aurora 17 military exercise, which Sweden proudly advertised as the largest since the end of the Cold War era as well as the first one to feature US tanks on Swedish soil. The collision between a passenger train run by Swedish railway operation SJ and a combat vehicle engaged in the Aurora exercise occurred at a railway crossing on the regional line between Västerljung and Vagnhärad south of Stockholm, the Swedish newspaper Expressen reported. According to the police, four people were injured, of which one was taken to the Karolinska University Hospital with an ambulance helicopter. Swedish Armed Forces press officer Jesper Tengroth confirmed that three soldiers from the P7 Southern Skåne regiment were taken to nearby hospitals. "What we can say is that an armored car of the Pansarterrängbil 360 class [Patria AMV] has collided with a passenger train," Jesper Tengroth told Expressen. A preliminary investigation into what was cited as "negligence in traffic" has been launched. SJ reported that the accident involved a regional train that was on its way from Norrköping to Stockholm Central station, when it collided with the combat vehicle. Eyewitness Atia Rasul added that a fire subsequently broke out in one of the cars. "The locomotive got derailed, but the cars remain on the track. The driver got a slight arm injury," SJ communications officer Karin Starkman Ahlstedt reported. The police blocked all access to the crash site and launched a preliminary investigation into what was classed as "negligence in traffic," Åsa Willsund of the Södermanland police reported. The Swedish Transport Administration announced a stop in train traffic between Vagnhärad and Nyköping due to the accident. At present, the Aurora 17 military drill is taking place in the area, and local traffic was expected to be impacted as a result. Aurora 17, which cost Sweden's state coffers 580 million SEK ($73 million) is the country's biggest operation of its kind in 23 years, where the army, the air force and the navy collaborate in a single drill. Apart from Swedish troops, it features hundreds of soldiers from the US, fellow Nordic and Baltic countries, as well as France. It is also the first time that US tanks have appeared on formally neutral Swedish soil. Aurora 17 is accompanied by Northern Coasts, yet another international exercise in the Baltic Sea. — Försvarsmakten (@Forsvarsmakten) 23 сентября 2017 г. ​The Northern Coasts drill was also set back by misfortunes. A Danish naval officer lost his life in an accident involving a hatchway outside the Danish island of Bornholm, whereas a Polish sailor drowned outside the Swedish port of Karlskrona, after falling overboard with a shipmate, the Swedish newspaper Aftonbladet reported. Northern Coasts is one of the largest annual multinational marine exercises in the Baltic Sea region. This year's edition was hosted by Sweden and featured about 5,000 people from the Nordic and the Baltic countries, as well as other NATO member states. — Försvarsmakten (@Forsvarsmakten) 15 сентября 2017 г.